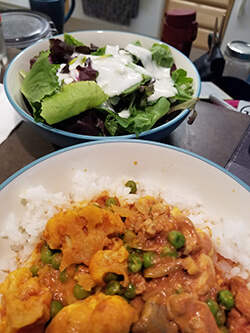 It’s been a little bit since I shared a “what I eat in a day” post so I thought I’d share what I ate while working from home last Tuesday. Of course, I wasn’t “at home” the entire time since I got my stitches out and spent some time working from the car dealership so it’s interesting how I worked my food around these appointments and my run. I’m coming up on the sixth month mark of intuitive eating and I’m settling into eating based on how I feel versus eating to fulfill specific macro/calorie goals. One thing that has changed since I started intuitive eating is that it’s a lot easier for me to get in vegetables and I’m not eating as much fruit as I had been. Which is so interesting since getting in enough vegetables in the past has been harder and now I’m eating a ton of them without realizing. Which you might have realized from the recipes I’ve been sharing lately. So let’s get on with how I ate in a day working “from home”! Even though I was working from home, I still got up at my normal time so I ate breakfast at 5 a.m. 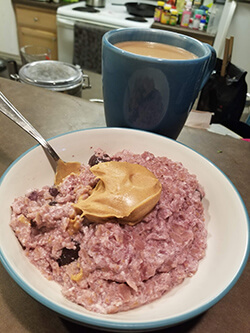 I had shredded a bunch of carrots earlier in the week so I made my Golden Milk oatmeal along with coffee. It’s so chilly when I wake up (we keep the temperature lower at night since we sleep better but it’s chilly when I’m not in bed) so this breakfast always warms me up! Even though I had breakfast at about 5 a.m., I wasn’t feeling that hungry while waiting for my car’s oil change to be done. My appointment was at 10:30 a.m. and I was there until noon (my car needed some lights replaced so it took longer) but I just sipped on some coffee while working. Usually I’ve brought a RXBar or Larabar while waiting for my car but with how close it would be to lunch I didn’t feel like I needed to. Plus, if I got really hungry, there was a bunch of Chewy bars and fruit by the coffee/tea area. Even though I wasn’t hungry at the car dealership, by the time I got home I was! We had leftover chicken, sweet potato and kale soup in the fridge and i decided to top that with some parmesan cheese. Since it’s very fall-like outside, this soup was the perfect thing to warm me up. Even with a later than usual lunch (I didn’t get home from the dealership until 90 minutes after my usual lunch time), I still wanted to eat a snack before getting out for my run. I didn’t eat a ton for my lunch (just the soup) and I had a harder 5K interval workout planned so I ate a Larabar 60 minutes before I planned to gout. 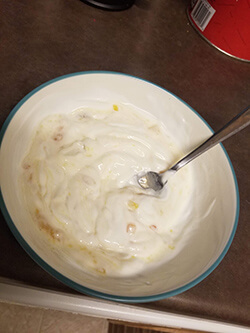 Larabars have been my go-to pre-workout snack and I’ve found that eating one about 60-90 minutes before my workout keeps me fueled without my stomach getting upset. Even though I had the Larabar before my run, I was so hungry once I got back. Which makes sense since I had run hard (8:30 average pace for 3 miles!) and I didn’t have much food earlier in the day, especially when it comes down to foods that have fat. So I made a nice, warm protein cake with berries, cocoa powder, protein powder and peanut butter. So delicious! After my post-run snack and showering, I was still feeling hungry. It was a good thing that dinner didn’t take too long to make. I made a spinach-mozzarella ciabatta loaf along with salmon. My load slice was probably a little bit too big considering I’d just eaten but I love ciabatta and it was delicious. As with most nights, I settled down for a cup of Sleepytime tea after my meditation. Mike was super nice and made it while I meditating so I just had to sit down and sip on it while watching The Gong Show. 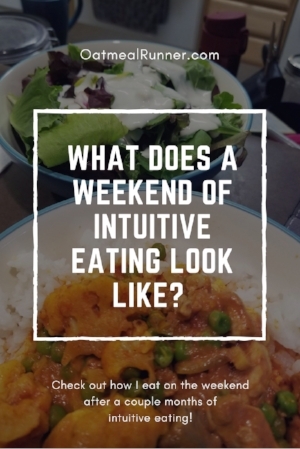 What Does a Weekend of Intuitive Eating Look Like? Since I’ve been eating intuitively for a couple of months, I thought I’d share what I ate this past weekend. I’m pretty excited about how my progress has been going with intuitive eating, I’ve been a lot more conscious about when I’m hungry versus grabbing something because I’m bored and I haven’t been eating (as much) just to eat. I also jumped on the scale just to see and I’m only about a pound up from when I stopped counting macros which is amazing considering I was eating a lot at the beginning just because I paying attention to my body cues as closely as I am now. I ended up not having a protein smoothie after my five mile run, I had breakfast not too long before it and I wasn’t that hungry after my run so I just had a little bit earlier lunch after I was done with my run and grocery shopping. 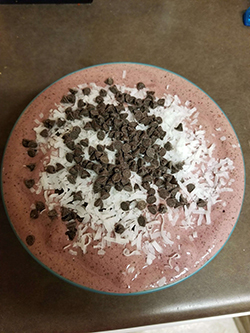 I did have an afternoon snack of a protein smoothie bowl with mini chocolate chips and coconut flakes. Dinner was later than usual since I took a long nap after the smoothie bowl but I wasn’t too hungry so it was on the lighter side (with lots of vegetables). You can tell I had a bigger appetite after my 10 mile run, I had a lot more food throughout the day (including carbs) but I never felt stuffed or like I was eating because I was bored.